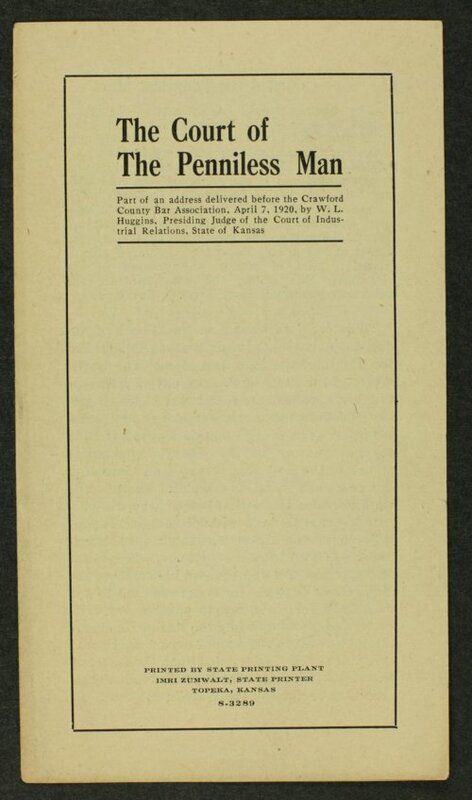 The pamphlet includes part of an address delivered to the Crawford County (Kansas) Bar Association by W. L. Huggins. Huggins was the presiding judge of the Court of Industrial Relations. Huggins described the Court as fighting to defend the interests of all hard-working men, indicating all deserved equal rights and protection with no regard to financial status. The Kansas legislature created the Court in 1920 to resolve labor disputes. The Court was declared unconstitutional by the U.S. Supreme Court in 1923. The pamphlet was printed by the State Printing Plant, Imri Zumwalt, state printer.